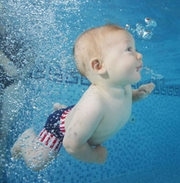 Water Babies Fla teaches babies and kids of all ages and swimming abilities. We specialize in working with children that have aqua-phobias, children with special needs such as Autism, ADHD, ADD, Down Syndrome & children with physical disabilities. A single lesson plan or approach doesn't work for all students. Our instructors use non aggressive teaching techniques that will allow your child to become comfortable, and eventually love water. It is also crucial to let students know that you are there with them, physically and emotionally, that you are always there to keep them safe and that you understand when they are struggling to accomplish a goal. Our Students must always complete their lessons with a sense of accomplishment. We always recognize our students, victories no matter how big or small. We emphasize the importance of safety rules. It generally takes about 10 lessons for a someone to learn how to swim, depending on such factors as general temperament, ability, attitude of ones parents and past experience in the water. We offer private, semi private and group swimming lessons for adults & children, plus aqua aerobics & fitness swimming. Our swim school runs year round currently teach in West Palm, Broward, Weston, Miami Dade area, as a part of our service we are mobile and come to you or we offer lessons at a pool nearby.